Freehand was purchased by Adobe, so will probably be phased out eventually in favor of Illustrator. That's life! The blend tool is very, very useful. Sure the appearance of a blend can be approximated by a combination of objects with various gradients, but using a blend tool is so much easier. Very nice deck plans so far. What bridge have you stuck in there? Is it the Grissom's or something you made? Anyway, here's that roughed out cross-section and a a basic layout of how I'm thinking the shuttle & cargo bays are arranged. At the back of the rectangular section that is behind the 'saucer' - where the impulse engine is... along that back edge looks like overlapping, sliding doors. I reckon prime place for cargo doors, rather than shuttlebay doors - seeing as there are already 'shuttlebay'-looking doors around the saucer rim. Ok, I think I've addressed all of Masao's points and noticed a few of my own. Still rather desperately need a clear view of the underside of the saucer substructure, especially the impulse engine's structure. 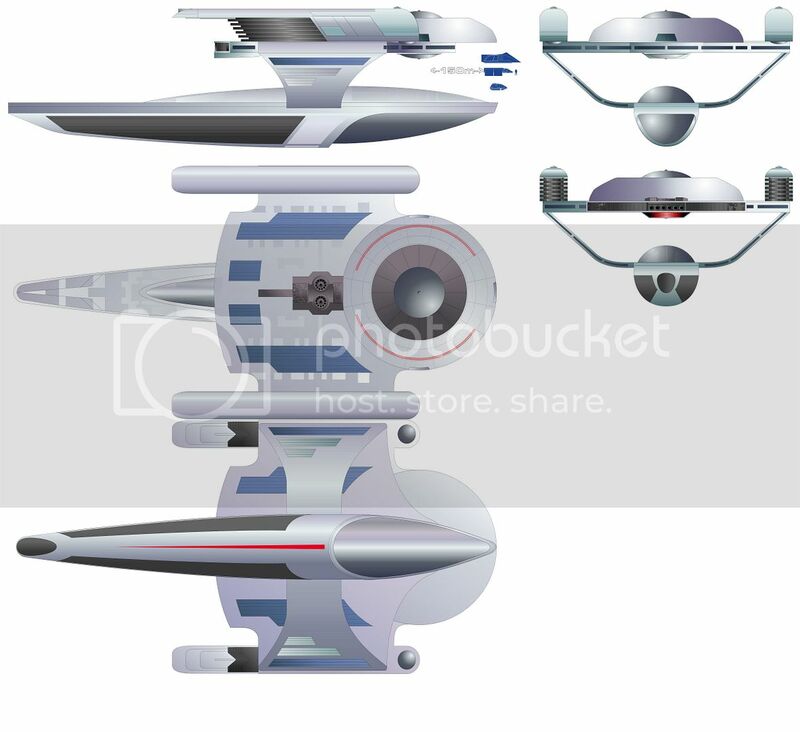 Any possibility you could include a runabout for size comparison? It's one of the best people-ship size comparisons we've had on screen. Tell me about it! I'm still using PSP X because 5 mins using XI told me Corel had completely fudged it or sacked most of the old Jasc people that were probably still around when PSP X was made. I've always had difficulty finding my way around Photoshop and Illustrator (compounded in the latest version by ultra low contrast menus) and there's nothing more irritating than not being able to use the keyboard shortcuts for vector node editing that I've been habitually using for years. It's the TMP Enterprise that I rearranged based on the one or two screen caps I could find. I'm almost certain the Fact Files did one of their 3D illustrations for Grissom, but for some reason nobody seams to have scanned it. Yeah, as you can see on the dorsal plan that's where I have the main cargobay access. I'm not convinced by having the shuttles in the saucer, as it doesn't make sense to me to crowd an already crowded primary hull. At the moment I have them down as either docking ports and/or airlock to smaller cargo bays. Just more evidence that the model builder thought this was going to be much bigger than it was portrayed. I'm pretty sure FF made a grissom illustration too. I remember thinking there were way too few stations on the thing. Rev, still need an accurate Oberth reference for the ventral saucer? Is that the studio model, though? Weird, I must have tried half a dozen googles trying to find it before. As for the reference photos, while the model is well made it doesn't look like the filming miniature and I'm determined to stick to primary data sources so I'd rather see the reference they used to make that model. The Grissom bridge drawing from the Fact Files/Magazine is very familiar. Good luck on this project. I've come a long way for the power of Genesis, and what do I find? A Square Pegs reject, another actress playing Saavik, and Leonard Nimoy's stand-in. It's probably as close to the filming model as possible- Thomas sasser is the guy with seemingly-unlimited access to Paramount's shooting models (pre-auction, obviously). He's the guy that mastered Polar Light's (incredible) 1:350th Enterprise kit, the TOS E and Klingon kits and has the blessing of Paramount. Seriously- the guy's a detail and accuracy enthusiast: I'd bet real cash that his model is prop accurate. Quick update to the deck layout. May be some more soon. I have been following his blog and I'm sure if he has anything good he'll get around to it eventually. No sense in imposing on generosity.